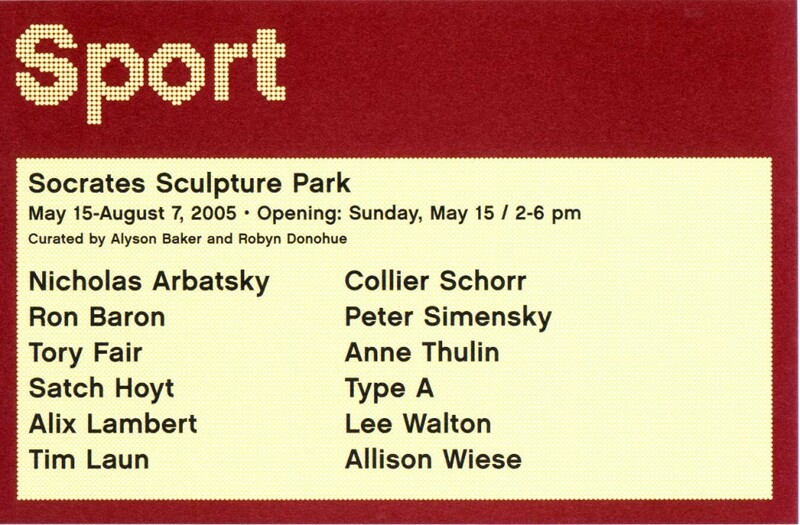 Socrates Sculpture Park is pleased to announce the opening of Sport featuring new works by Nicholas Arbatsky, Ron Baron, Tory Fair, Satch Hoyt, Alix Lambert, Tim Laun, Collier Schorr, Peter Simensky, Anne Thulin, Type A, Lee Walton, and Allison Wiese. Curated by Alyson Baker and Robyn Donohue, this exhibition is centered on the themes of athleticism, competition and game, and includes works that use sports as both medium and metaphor, employing the equipment, performance and spectatorship of competitive games as a language for addressing a broad range of issues. Although some pieces in the show are based on contemporary, high-performance sports such as Nicholas Arbatsky’s snow boarding installation, works by Collier Schorr, Anne Thulin, Type A and Ron Baron take a more nostalgic tone, re-examining the sports hero with a sense of loss or with a historical perspective. Also evoking the lost legend, Alix Lambert presents a pair of bronze gloves in a concrete and steel boxing ring. Sculptures by Tory Fair and Peter Simensky examine the demarcations of the playing field and the grandstand as stages for the performance of orchestrated interactions between players and spectators. In Tim Laun’s installation, the action on the field is isolated into a single, suspended moment focusing on the motionless position of preparation below the tall arc of an airborn football. Lee Walton also addresses the physicality of sports — performing the very demanding task of carrying 35 pound weights from a sporting goods store in Manhattan to his installation at Socrates. Both Satch Hoyt and Allison Wiese use sound in their installations- presenting a visual reference point while using an aural experience to evoke the heightened emotion and rush of adrenaline that are shared by the cheering crowd and the competing teams. The opening reception will feature a performance by Spottiswoode & His Enemies, a New York City-based rock band fronted by a prolific English songwriter. Their music has been compared to Tom Waits, Leonard Cohen, Nick Cave and David Bowie. The New York Post calls them “Captivating…A magical experience!” This concert is generously sponsored by the Long Island City Business Development Corporation. This exhibition is made possible by the dedication and support of our volunteers and friends and by the generosity of: Shuree Abrams Foundation, Altria Group, Inc., Milton and Sally Avery Arts Foundation, Carnegie Corporation of New York, The Cowles Charitable Trust, Mark di Suvero, The Fifth Floor Foundation, Maxine and Stuart Frankel Foundation, The Horace W. Goldsmith Foundation, Gabrielle and Herbert Kayden, Mitchell and Abby Leigh Foundation, JPMorgan Chase, Sara Meltzer Gallery, Richard and Ronay Menschel, Ivana Mestrovic, National Endowment for the Arts, New York Community Trust, New York State Council on the Arts, The Pincus Charitable Fund, Brooke Kamin Rapaport and Richard A. Rapaport, Rev. Alfred R. Shands III, Mr. and Mrs. Thomas W. Smith, Janice Stanton and Ronald Windisch, The Tulip Fund, Von Rydingsvard and Greengard Foundation, and The Andy Warhol Foundation for the Visual Arts. This program is supported, in part, by public funds from the New York City Department of Cultural Affairs. Special thanks to the City of New York, Mayor Michael R. Bloomberg, Queens Borough President Helen M. Marshall, City Council Speaker A. Gifford Miller, Assemblywoman Catherine Nolan, City Councilmember Eric Gioia, and the Department of Parks & Recreation, Commissioner Adrian Benepe. Socrates Sculpture Park is grateful for the generous contributions made by: Harold H. Anthony, Inc., Bedi-Makky Art Foundry Corporation, Kevin Biebel at J. Frederick Construction, John. 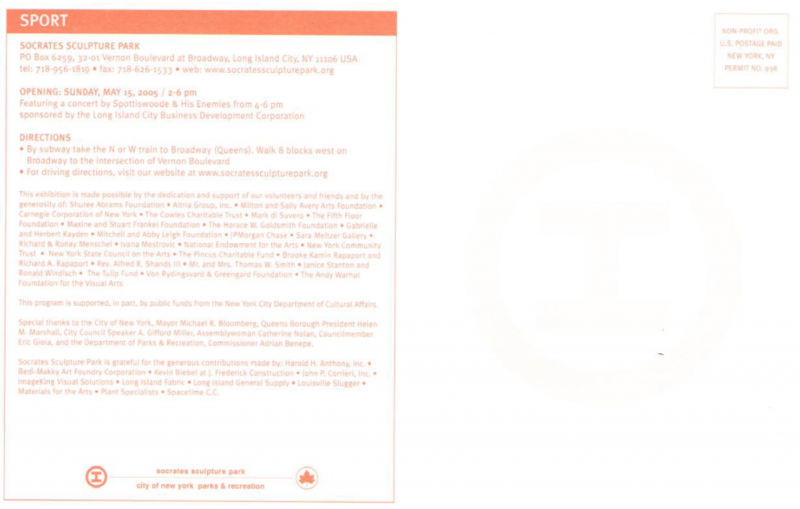 P. Corrieri, Inc., ImageKing Visual Solutions, Long Island City Business Development Corporation, Long Island Fabric, Long Island General Supply, Materials for the Arts, Plant Specialists, Puma International, Seating Solutions, and Spacetime C.C.